The winning team shows off their prizes with Baron Eric de Rothschild. Competitive drinking at the collegiate level doesn't usually require a knowledge of the history and culture of Bordeaux and a palate attuned to the nuances of Médoc terroir. But that's a must-have if you're vying for victory at the Left Bank Bordeaux Cup, a trivia and tasting showdown of university wine clubs that has gained international prominence in the past two years. This year, 42 different schools, from California to Denmark to Shanghai, battled it out in regional primaries, with the eight finalists facing off on June 28 at Château Lafite Rothschild. The Left Bank Bordeaux Cup started as a competition called "20 Sur Vin" in 2002, put on by the Commanderie du Bontemps of the Médoc, Graves, Sauternes and Barsac, and in 2011 teams from the United States and Asia were invited to compete. 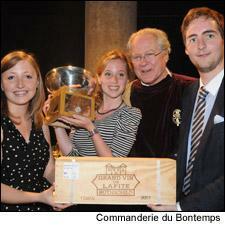 That year, Harvard Business School emerged from Lafite's massive barrel room international champions; the French teams took seventh and eighth. "Overall, the skill level is improving" each year, said Emmanuel Cruse, grand maître of the Commanderie and proprietor of Margaux's Château d'Issan. This year's American preliminary was held in January at the French Consulate in New York. In addition to the questions, there are rounds of blind tasting, in which teams of three must identify the age and appellation of three reds or Sauternes on the table. In a field that included Stanford Business, Yale Law and Columbia Business and Law school teams, Chicago triumphed. The Wharton Business School of the University of Pennsylvania was the runner-up, locking up the second spot at the Lafite finals. For the elite teams, training becomes a part of life. Booth School players had to audition for their spots last October. Since their January victory, Kant estimates they've tasted through four or five cases of Bordeaux, much of it Grand Cru, which would put a dent in the wallet of any college student. Teams arrived in Bordeaux on June 25, and over the next three days visited and tasted or dined at 10 different châteaus, including Beychevelle, Suduiraut, La Mission Haut-Brion, Margaux and, finally, of course, Lafite, where owner Baron Eric de Rothschild presided. "I have to say that it definitely surpassed all of our expectations, even with an extremely high level of anticipation," said Kant. "It was ridiculously fun." Camaraderie ran high throughout the week. "During the lunches and the dinners, we could sit wherever we wanted, so we tried to meet with all the teams to speak with them," said Jean-Sébastien Philippe, a student at France's Ecole des Hautes Etudes Commerciales du Nord Lille (EDHEC Lille). But it was all business approaching game day. "Some teams had brought little notebooks to all the different tastings, taking furious notes. There was a little bit of trying to psych other teams out," said Kant. On the evening of the 28th, the teams were marched down candlelit corridors past rows of dusty bottles and ushered through the giant cellar doors into the Lafite barrel room ("It had the feel of a Dan Brown novel," said Kant.) The teams took their places in a circle on a dais. The Commanderie entered in their billowy robes, heralded by trumpets. The quiz and tasting were "very, very difficult," said Philippe. But national pride was on the line: "We were very unhappy with the French record of last year. It's a shame because we are in France, in Bordeaux. You can understand that we have competitiveness." After winning both the quiz and tasting portions, EDHEC Lille took the crown, with Chicago placing second, followed by Copenhagen and Wharton. The night ended in song and dance, with a feast of oysters, langoustines and other local dishes. That a competition that was once an obscure France-Britain tussle for Bordeaux bragging rights exploded into the World Cup of wine in just two years reflects some recent developments in wine culture and emerging drinkers. One is the rise of the university wine club. At Chicago Booth, the club has 350 members—almost a third of the student body—making it the largest extracurricular activity at the b-school. These clubs conduct seminars, classes, winemaker and sommelier lectures and informal tastings. And it's not limited to the U.S.—Lille's club, called Dionysos, attracts about 80 people to most of its tastings. Columbia Business spends some $25,000 on wine a semester for a class run by the wine club; at a recent lesson, 1995 Aldo Conterno Granbussia, 1994 Domaine Chevalier Blanc and 1986 E. Guigal La Landonne were among the wines poured. At Booth, the parties are fun, but members "really want educational events," said Kant. The Cup is also perhaps the most visible and successful attempt by the Bordelais to reach a new, young market. "This is very much a marketing exercise," said Fortune. "[The Commanderie] are very smartly targeting a good group of people who may not be able to afford Lafite today," but are the prime potential Bordeaux buyers of the future. Cruse understands the value of what he has helped build: "I think this competition is becoming more and more important for us. It's definitely one of the new ways to try to interest a younger generation in Bordeaux and great wines." Whether the Cup contestants remain Bordeaux partisans remains to be seen, but one outcome of the experience is clear: Young people who are passionate enough about wine to compete seriously in it, and who are in the process of deciding where to aim their careers, are looking hard at the wine industry. Last year's victorious team graduated one member to Dom Pérignon and another to online retailer Lot18. Kant is working this summer at Winestyr, a retail startup. As for Philippe, he had to miss the Fête de la Fleur dinner for champions on Friday to hop the first flight back to Paris and catch a meeting at LVMH, where he is interning now. I would find it very interesting to have the competition participants act as judges at yet another Bordeaux v. Left Coast blind tasting.